British astronaut Tim Peake will be the first British crewmember of the International Space Station when he launches in 2015. He represents the UK and European space agencies. LONDON — The first British astronaut ever to visit the International Space Station will launch in 2015 for a six-month mission that may involve spacewalks, wrangling visiting robotic spacecraft and space experiments, the UK Space Agency announced today (May 20). European Space Agency astronaut Timothy Peake, 41, will be the first British astronaut to fly in space in 20 years when he launches aboard a Russian Soyuz spacecraft in November 2015. His mission was unveiled at London's Science Museum today. "This is another important mission for Europe and in particular a wonderful opportunity for European science, industry and education to benefit from microgravity research," Peake said in a statement. He will also represent the UK Space Agency on the mission in addition to the ESA. In training for the mission, Peake will learn how to use the European Columbus module, U.S. Destiny and Japanese Kibo laboratories on the International Space Station. His research work could include experiments in biomedicine, human physiology and the space environment. An experiment selection process is under way, officials said. However, space station astronauts have had to perform emergency spacewalks for unscheduled repairs and maintenance, and Peake has had the necessary training for those tasks. Peake may also have to grapple with visiting spacecraft using the space station's Canadian-built robotic arm, Canadarm2. "There are three vehicles planned to visit the station, two SpaceX and one Japanese HTV, and all three will require berthing and grappling," Peake said. "It's too early to tell if I will be undertaking that, but I will be qualified for those tasks." British astronaut Tim Peake participates in a weeklong expedition into the Sardinia caves of Italy in 2012. The cave training is a simulation for space exploration missions. Peake's selection to join a space station crew is a giant leap forward for British space science. "This is a momentous day, not just for Tim Peake but for Great Britain," British Prime Minister David Cameron said of Peake. "I am sure he will do us proud and I hope that he will inspire the next generation to pursue exciting careers in science and engineering." Peake's mission selection follows a 2012 announcement of an increase of 240 million British pounds (US $365 million) in the UK's funding to ESA over the next five years. This increase included 12.4 million pounds ($18.8 million) for microgravity research and 16 million pounds ($24 million) for communication and propulsion technologies for the ESA contribution to NASA's Orion crew exploration vehicle. That ESA contribution, a service module for Orion, means a European astronaut could potentially fly on NASA's Orion spacecraft or even the U.S. agency's planned asteroid mission in the 2020s. In June 2012, Peake spent 12 days practicing an asteroid mission at the bottom of the ocean under NASA's Extreme Environment Mission Operations program. Known as NEEMO, the project sends teams to the Aquarius laboratory 60 feet (18 meters) below the ocean surface off Florida. It is used to test technologies and research crew behavior for long-duration missions. With his NEEMO crew mates, Peake had to deal with 50-second communication delays, replicate the 9 million mile-distance from Earth an asteroid mission may involve, and learn how to anchor to a surface to re-create what is needed to clamber over a near-Earth object. British astronaut Tim Peake works with a Russian Orlan spacesuit. A former British Army Apache helicopter test pilot, Peake in May 2009 became the first UK citizen to be selected for astronaut training by the European Space Agency. From Chichester, England, Peake is married with two children. He spent 18 years in British Army aviation, rising to the rank of major, before becoming a test pilot for helicopter company AgustaWestland. Peake was selected as an ESA astronaut in 2009 and will be the fourth member of his six-person astronaut class to go into space. 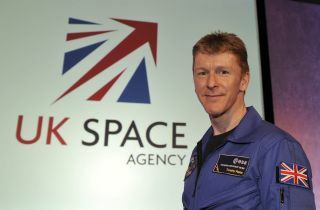 Peake already participates in an outreach program for schools, called Mission X, and the UK government has appointed him an ambassador for science and space-based careers. After the selection, Peake and his classmates completed 18 months of basic astronaut training in November 2010, which included learning Russian and how to operate the Soyuz spacecraft. Earlier that year, Peake and his classmates underwent two weeks of survival training on the Italian island of Sardinia. In 2011, Peake and his fellow astronauts returned to Sardinia for a week-long isolation training underground in caves. British astronaut Tim Peake joined the European Space Agency's astronaut corps in 2009. Peake’s ESA astronaut class includes Italy's Luca Parmitano, who flies to the ISS in eight days, on May 28, and Samantha Cristoforetti, who flies in 2014; Germany's Alexander Gerst, who also flies in 2014; and Frenchman Thomas Pesquet and Denmark's Andreas Mogensen, who are yet to be assigned missions. Pesquet may also become a candidate for a joint ESA-China space mission. Pesquet is learning Chinese as part of ongoing astronaut training cooperation between ESA and China's space program. Pesquet will still visit before 2017, but later in the decade he will be a candidate to fly on China's Shenzou spacecraft and for a Tiangong space laboratory flight or to the larger space station China plans to build by 2020. Parmitano, NASA’s Karen Nyberg and Russia’s Fyodor Yurchikhin are to launch on May 28 aboard Soyuz TMA-09M for Expedition 36 and Parmitano will remain for Expedition 37. Each expedition lasts three months and astronauts typically do two. Gerst will go in May 2014 for Expeditions 40 and 41, returning to Earth in the November. Cristoforetti will be on Expedition 42, which will probably launch in November 2014. Peake is the sixth British-born person bound for space. The first was Helen Sharman in 1991. Sharman flew to Russia's space station Mir after 18 months of cosmonaut training for the Project Juno mission. The other British-born spaceflyers include NASA astronaut Michael Foale, who has dual U.S.-British citizenship, and flew for U.S space shuttle, Mir and International Space Station missions; Richard Garriott, the American son of NASA astronaut Owen Garriott, who paid for a private trip to the space station in 2008. Garriott is a U.S. citizen but was born in the UK; NASA astronauts Piers Sellers and Nicholas Patrick, who both obtained U.S. citizenship and visited the space station during shuttle missions.